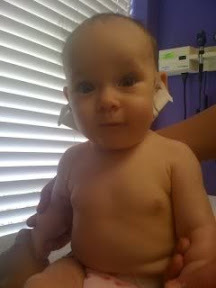 In honor of the fact that I recently called and made the appointment with our pediatrician's office to have Pop Culture Baby(2)'s ears pierced with her first-year well-baby checkup, I am re-sharing (with minor edits) my blog posts about our experience the first time around. These originally appeared on WTE back in my former life as a Featured Blogger on that site. Enjoy the trip down memory lane! Infant Ear Piercing – A Cultural Issue? I had never considered infant ear piercing a hot topic until I joined the What to Expect boards. I always considered infant ear piercing second nature. I had my ears pierced when I was only a few months old. 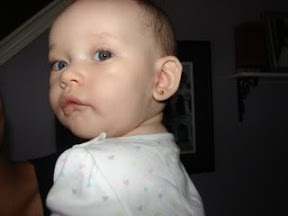 Every girl in my family had her ears pierced as an infant. All of my friends with girls clearly have no problem with infant ear piercing, because all of their daughters had their ears pierced as babies. But when I was pregnant, I joined these boards and witnessed moms-to-be (and at least one dad) arguing with each other over the issue of infant ear piercing. I began to wonder, Am I missing something? I mean, why was everyone so passionate about such a non-issue? Slowly, I began to notice a pattern. The people who were so dead-set against infant ear piercing were largely (though certainly not exclusively) Caucasian, Christian and American (hereinafter, “CCA," solely for the purpose of abbreviation, and not for any other reason). Ear piercing by many of these women was couched in terms of a “bonding experience” or something you do when your daughter “asks for it.” Maybe it’s a cultural thing, but I’ve never seen ear piercing as something to bond over. I’ve gone with my older sister when she got her ears pierced (a re-piercing), my mom when she got hers done (a second hole), and even my dad when he got his done (suspected mid-life crisis), but never did it seem like something you bond over. I just didn’t get what the big deal was. And as far as asking, I grew up with the mentality that kids don’t get things just because they asked for it, nor do they get to opt out of things simply because they don’t [dinnertime would have been really different growing up if I could have just opted out of things]. I’m not questioning people who think that way – far from it – I’m just saying there’s a different cultural perspective on it. Most of the parents I know who don’t think infant ear piercing is a big deal are not CCA – we’re each missing at least one part of the acronym. Yes, I have friends who are CCA who don’t consider it a big deal, but they seem to be small in number. Pop Culture Dad is CCA (kind of), and he was at first against getting Pop Culture Baby(1)’s ears pierced just because he had “never heard of it.” After taking a survey of my family and our friends and co-workers who, like me, are not CCA, he began to understand that a lot of people don’t think infant ear piercing is a big deal. He, too, concluded it must be a cultural thing; and since our daughter is a reflection of her mixed backgrounds, he is now on board with piercing her ears. When we get Pop Culture Baby(1)'s ears pierced, my husband is going to go with us. It won’t be a bonding experience, but we both want to be there with her to hold her little hands. We would have gotten it done already, but Pop Culture Baby(1) has this bad habit of pulling her ears. My hubby and I have agreed that when she stops doing that, we will pierce her ears. To each his/her own. If you don’t like the idea of infant ear piercing, don’t do it. But don’t tell me or anyone else something’s wrong with our families because we do. Like many traditions, this seems to be an issue that varies among families and perhaps even cultures. So embrace your own traditions, and don’t stress about what goes on with other’s. When this piece was originally written, it became one of my most talked about and controversial postings. Apparently, just mentioning something about which people have such widely varying (and strong!) opinions gives them a desire to talk (passionately) about those varying opinions. Honestly, only half the mothers who expressed opinions on this piece addressed my initial inquiry about whether or not the opinions were the result of cultural differences. From a survey of those comments, it seems I missed one part of the equation: for those moms in the CCA category who have no problem with earrings on infants, they were largely from the South (as I am). Of course, I will always acknowledge that the are exceptions to every rule, and my pondering was not meant to create some sort of stereotype. As far as rehashing the issue, I am honestly not interested at this time. Thankfully, the hundreds of heated comments on this piece got buried when WTE moved to a new blog platform (they're still there, but you would have to do some crazy detective work to weed through and find them, and, trust me, it is not worth your time). I don't personally care why people pierce or don't pierce. We did it, we're doing it again; and quite frankly I don't care if some person off the street (or even some "friend" or relative) wants to judge me for it. If you do, for whatever reason, want to discuss infant ear piercing, cultural aspects or otherwise, feel free to do so in the comments here. But heed some warnings: I am a member of The Mom Pledge. Put in simple terms: I do not feed the trolls. I will not tolerate name-calling, bashing, or inflammatory statements. If you want to call me or a fellow commenter names or question anyone's parenting skills/sanity/etc., take it to another site. If you want to compare earrings to female genital mutilation (seriously) or even circumcision (both permanent and irreversible decisions), take the hyperbole somewhere else, as that kind of gross and inflammatory exaggeration always leads to unproductive arguments. If you want to discuss your views intelligently and passionately (preferably with facts, whether cited or reasonably anecdotal), you are more than welcome here, whatever your views. I know that infant ear piercing can be a controversial subject, as evidenced by the debate in my earlier blog wondering if people's feelings about infant ear piercing are based on cultural perceptions. Whether it's a cultural issue or not, one thing I do know is that we have done it. 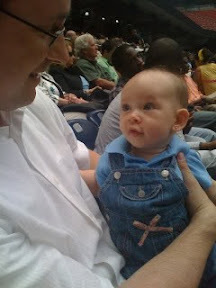 At the end of last month, we had Pop Culture Baby(1)'s ears pierced. The piercing was done at her pediatrician's office, along with her six-month shots. It was a pretty nice setup, actually. We checked in, and Pop Culture Baby(1) was given these little pads with numbing gel on them. The numbing gel stayed on her ears for an hour (this was actually the worst part of the entire experience). While the numbing gel did its business, Pop Culture Baby(1) got her shots. Our regular pediatrician did her normal checkup and answered my questions. Then, when the normal appointment was over, we walked to the waiting room of another doctor in our pediatrician's practice. She is the doctor who does all the ear piercings in the practice. 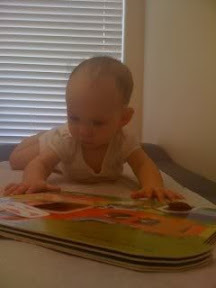 While we waited for the doctor, I read a book to Pop Culture Baby(1). Pop Culture Baby(1) got really into the book, so when the doctor showed up, she suggested that our au pair (who came with me) hold the book up for Pop Culture Baby(1) in order to distract her. As the doctor was getting ready to put the earrings in, my very nervous husband called because he had expected to hear from us already [we spent a LOT of time waiting]. When he heard the doctor's voice and realized she was about to do the piercing, he nervously hung up, because he was afraid to listen. He was worried for nothing, because Pop Culture Baby(1) did not even cry. She made a muffled "hmmph" sound after each one was done, but that was it. It's been a couple of weeks now, and her ears are doing well (they have been from day one). Pop Culture Baby(1) has actually stopped pulling on her ears since she's had the earrings. Now, she pulls on her neck instead. They look really cute on her, but I can't wait until the two months are over so I can get her different earrings. The doctor gave her gold earrings, since those are the most hypoallergenic. When she is allowed to have different earrings, I'm getting her platinum, since I hate yellow gold. We also have a pair of infant pearl earrings that I bought right before we got married (long story), which I will let her wear someday, but not just yet. Whatever people's feelings about infant ear piercing, I am happy with our decision. I have no regrets that my parents got mine pierced when I was an infant, and I am actually glad that it was done so young when I don't remember it. Everyone I know who had their ears pierced as an infant feels the same way. I'm not saying that means that's how everyone should do it. I'm just saying, this is what works for us. And, p.s., Pop Culture Baby(1) looks soooo cute! In the waiting room with the numbing gel on. "Reading" a book while we wait. Showing off the new lobes. So nice to put her in all blue and not get asked, "How old is HE?" I'm sorry to hear that your previous post generated such negative controversy. I am CCA and while I would never dream of piercing my own children's ears without them being old enough to thoroughly understand what was happening, that decision has a lot more to do with three failed attempts to have my own ears pierced (severe allergies) than any cultural reason. That said, I have seen the reactions you wrote about when in mixed company (CCA and not) and I agree it probably is a cultural issue more than anything else regardless of what people will admit. Anyway, my real reason for commenting was to say thank you for mentioning that you had the piercing done at a doctor's office. I didn't even know this was a possibility and should my own girls express a desire to have piercings now I will know a safe place to take them. Blessings to you and your adorable Pop Culture Baby. Thank you for your comment! Not every pediatrician's office does it, but if you can find one that does, it is well worth it. The environment is sterile, the person doing the ear piercing has a medical degree and some knowledge about children's bodies, and the topical anesthesia alone makes it worth it! I honestly wouldn't trust the 16-year olds at Claire's with my own ears, let alone my kids'! Ha ha!